Hey guys! I hope you are having a great week so far. I have three brand new colors to share with you from Ice Polish. Before you get too deep into the swatches and review, I would like to point out how cute the new Ice Polish labels are! 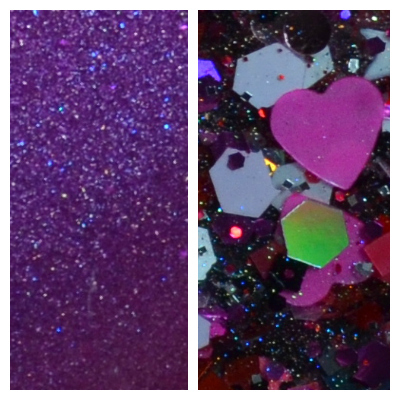 Do Ya Love Me is a pink holo with pink to purple bits. The effect is fairly subtle, but really neat when it catches your eye. The formula is a little thick, but nothing out of the ordinary. For best results, I recommend allowing each coat to dry for about five minutes before applying an additional coat. My swatches show two coats with a top coat. Shot Through the Heart is a pink, black, red and white glitter bomb consisting of various shapes and sizes. The formula was a great consistency, and I had no issues getting hearts or stars out of the bottle. The swatches show one coat of Shot Through the Heart over Do Ya Love Me, with a second coat on the ring finger. Meow-di Gras is a Mardi Gras inspired glitter bomb featuring cat shaped glitter. This was my absolute favorite of the three. I cracked up big time when I read the bottom of the bottle. The formula was a great consistency, and I was able to get plenty of cats without effort. My swatches show one coat of Meow-di Gras over Essie School of Hard Rocks with a second coat on the ring finger. If you have a cat lover in your life, you MUST get them this polish! All three colors are currently available in the Ice Polish Etsy store. Her new logo is adorable! I love that penguin. And, Meow-di Gras. Best polish name EVER. The logo on the bottle is too cute! Fun duo this is. I'm a huge fan of that glitter one.